The Bauhaus – its philosophy and its designs have broken down borders between countries, shaped the 20th century, changed our city-scapes and our homes – and all that in just over a decade. But I wonder whether the word is as familiar to current, internet generations as it was to their parents. Though the actual Bauhaus school, created by Walter Gropius, only ran from 1919 to 1933, its legacy is a part of our daily lives. The energy its philosophy unleashed was enormous. Artists and designers from the Netherlands joined the German Walter Gropius and had a great influence, both as designers and teachers. I would bet my bottom dollar that in every home in Europe I can find objects which owe their form to the Bauhaus school – Bauhaus style china, eating utensils and in particular lamps and armchairs are everywhere. So is Bauhaus graphic design and typography. 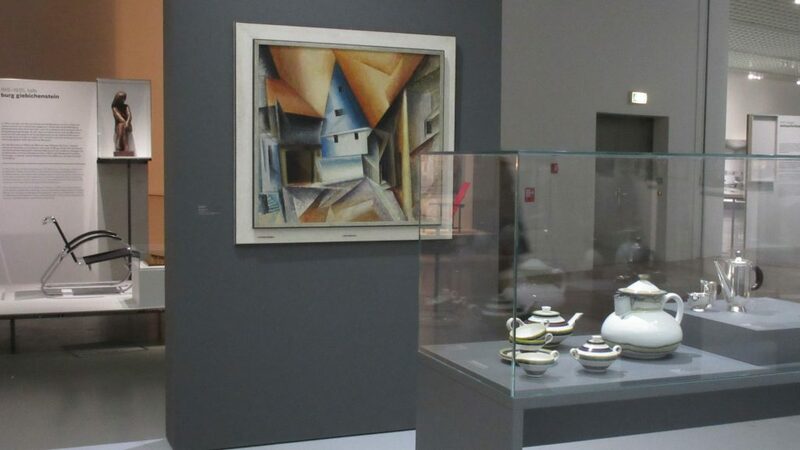 To mark the 100th anniversary of the creation of the Bauhaus, the Boijmans van Beuningen museum is staging an ambitious, all-encompassing exhibition. The creation of the movement came from the desire to start again after the 1914-18 war. Until then, many art schools had been places of the decorative arts and crafts. The year 1919 was the time to sweep the old away, make table rase, reinvent everything with clean, functional lines, giving materials their due respect – everything was up for renewal, from the spoon you ate with, the building you lived in, the chair you sat on, the most iconic being the Marcel Breuer chairs, their style still omnipresent, from Habitat down to Ikea today. And nowhere is the influence greater than in the Netherlands. Indeed, a walk through Rotterdam and Den Haag surprises with the presence of Bauhaus influenced architecture, such as the Bijenkorf department stores, designed by Marcel Breuer. Although, as an art student London, I often felt that some of my professors knelt a little too piously at the Bauhaus, and in particular the Mondrian altar, the movement did allow students, more than fifty years later, to throw off the shackles of classical art and at least have the illusion that we too could create something new and fresh. This important exhibition is beautifully laid out and curated with 800 objects, ranging from ceramics, textiles, furniture, product design and typography etc., many items loaned from private collections and shown here for the first time. The Bauhaus pioneers are too numerous to mention – creator Walter Gropius, Paul Klee, Kandinsky, Paul Citroen, Piet Zwart and Piet Mondrian, architect J.J.P. Oud, Gerritt Rietveld, designer of the chair in the colours of Mondrian, the rather querulous Theo van Doesburg, painter, architect, writer and founder and leader of De Stijl, etc. etc..